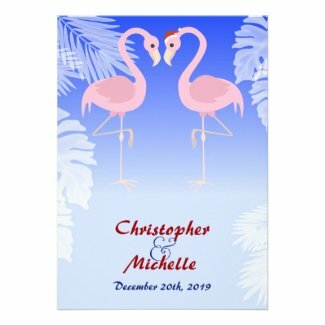 This cute and casual wedding collection features a pink flamingo couple on a tropical blue and white background. 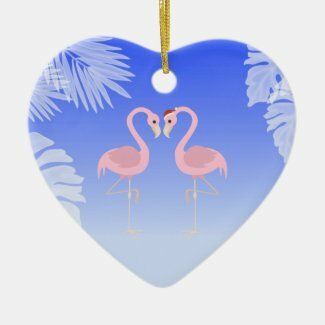 One flamingo is wearing a Santa hat and each piece in the collection has matching red text. It is the perfect choice for a Christmas holiday destination wedding. 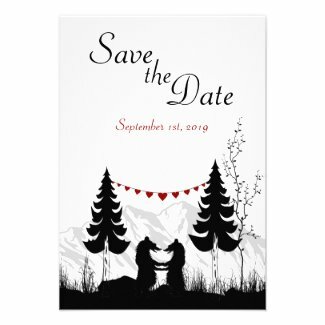 Take a look below to find wedding invitations, RSVPs, Save the Date announcements, custom postage and even a matching Christmas ornament. The following ornaments can be personalized, on the back, with the couple's names and date. 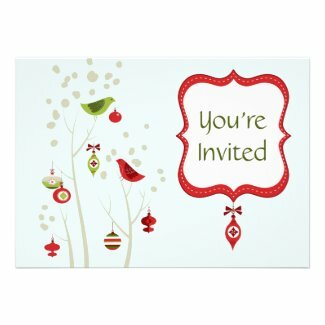 For additional invites take a look at Unique Christmas Holiday Wedding Invitations and Unique Beach Wedding Invitations. 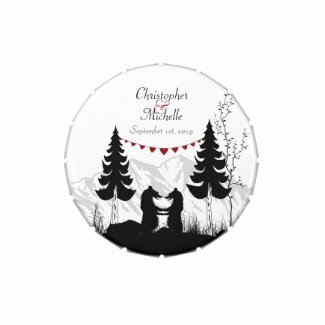 This collection is a great choice if you are having a wedding around the Christmas holiday and want to add a little uniqueness to your event. 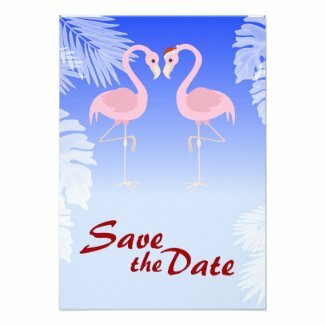 There are invitations, RSVPs, reception cards, Save the Dates and custom postage stamps. 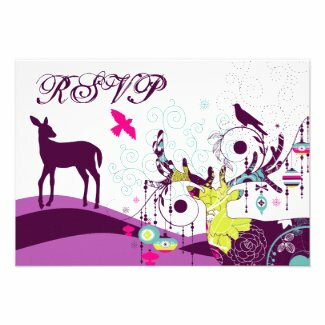 Each piece features a silhouette male deer sporting an amazing retro design that includes holiday ornaments, birds and other decorations. There is also a purple silhouette doe standing on a colorful hillside. Select any item featured below to view additional details and edit. 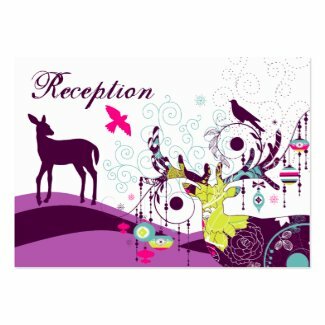 For even more invites, take a look at Unique Christmas Holiday Wedding Invitations and Unique Deer Wedding Invitations. 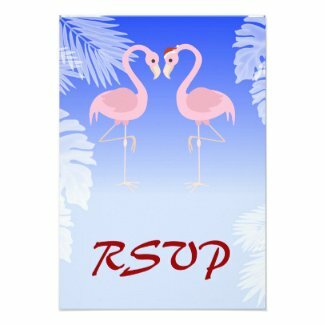 The second design features the same bird couple but in shades of green and red. They are decorating their tree during the day with a pale blue wintery background. 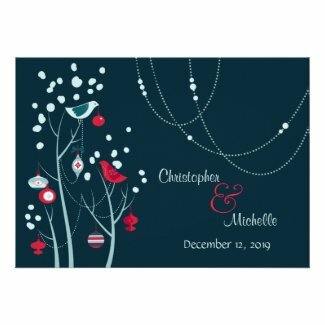 For even more holiday invites take a look at Unique Christmas Wedding Invitations. The small candy tin shown above is available with a White or Metal colored background. 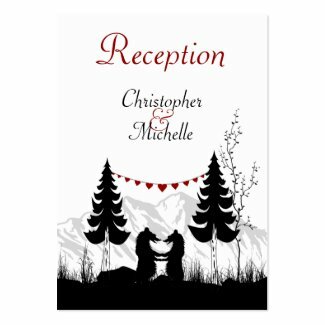 This charming wedding collection features two happy and in love silhouette bears. They are in a pine forest under a banner of red hearts with a beautiful silhouette mountain in the background. 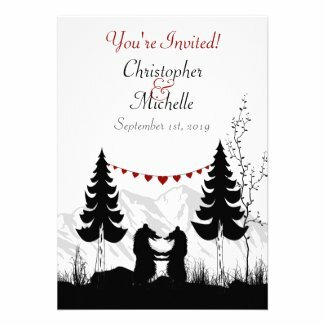 This design is available on Invitations, RSVP cards, reception cards, Save the Date announcements, favors and a few different matching postage stamps. Take a look below for the entire collection and select any item to view additional details and personalize. For the complete collection of favors take a look at the post, Mountain Bears Candy Tins and Jars Wedding Favors. 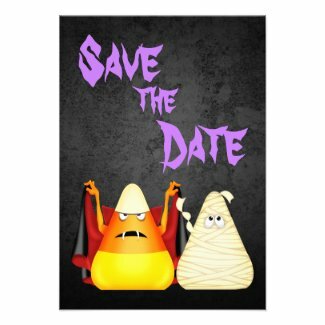 Add a little humor to your wedding announcements with this cute and spooky candy corn couple. It is perfect for letting friends and family know during the Halloween holiday and also a great choice if you want to announce a Halloween wedding. Select the Save the Date shown above to view additional details and personalize. For even more stamps take a look at the site Custom Halloween LOVE Postage Stamps. 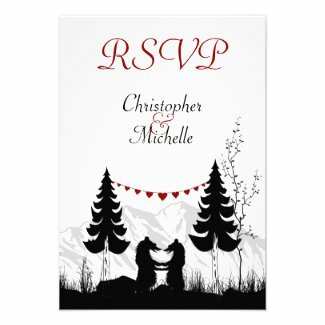 If you are having a Halloween wedding be sure to take a look at Unique Halloween Wedding Invitations.